The Qualcomm Snapdragon 660 (SD660) is a fast mid-range ARM-based SoC largely found on Android tablets and smartphones. Announced in mid 2017, the SD660 is the successor to the Snapdragon 625. It features 8 Kryo 260 cores (custom design, 64-Bit capable) that are divided in two clusters. A fast cluster of four cores with up to 2.2 GHz and a power saving efficiency cluster with up to 1.8 GHz. Both clusters can also used together. In addition to the 8 CPU cores, the SoC integrates a mid range Adreno 512 GPU with a LPDDR4 memory controller (dual-channel 1866 MHz) and supports Wi-Fi (802.11ac + MIMO, max. 867 Mbps), Bluetooth 5, and LTE (X12 LTE modem with up to 600 Mbps download and 150 Mbps upload). In Benchmarks of the Oppo R11, the CPU part of the Snapdragon SD660 performs between former high end Socs like the Snapdragon 821 in the Pixel XL and the Snapdragon 835. The graphics performance is however much lower, as the Adreno 512 is only a slight upgrade of the older Adreno 510 (due to the higher clock speed). The Snapdragon 660 is based on a similar concept as ARM's big.LITTLE, which combines a low power CPU cluster (2x Kyro clocked at up to 1.8 GHz) and a performance CPU cluster (2x Kyro clocked at up to 2.2 GHz). The clock speed of each cluster can be individually adjusted (but not per core) and the lowest clock speed is 310 MHz (unverified). 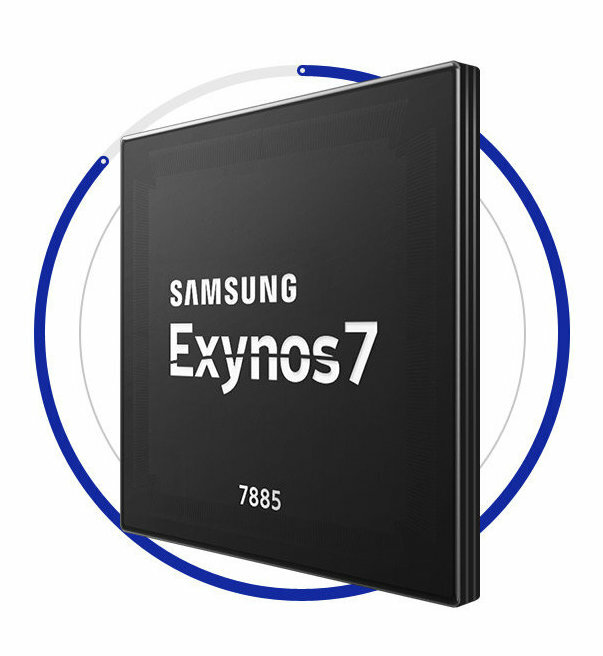 The Samsung Exynos 7885 (also called Exynos 7 Series) is a upper mid-range system-on-a-chip (SoC) for smartphones and tablets. It was launched early 2018 alongside the Samsung Galaxy A8 2018 series and features two Cortex-A73 cores clocked at up to 2.2 GHz. Furthermore, there are six power efficient Cortex-A53 cores at up to 1.6 GHz, an ARM Mali-G71 MP2 GPU and a LPDDR4x memory controller. The integrated LTE modem supports LTE Cat.12 3CA 600 Mbps download speeds and Cat.13 2CA 150 Mbps upload. 802.11ac WiFi, Bluetooth 5.0 and FM Radio are also in the chip. It is manufactured in 14nm FinFET at Samsung and therefore a rather power efficient SoC.